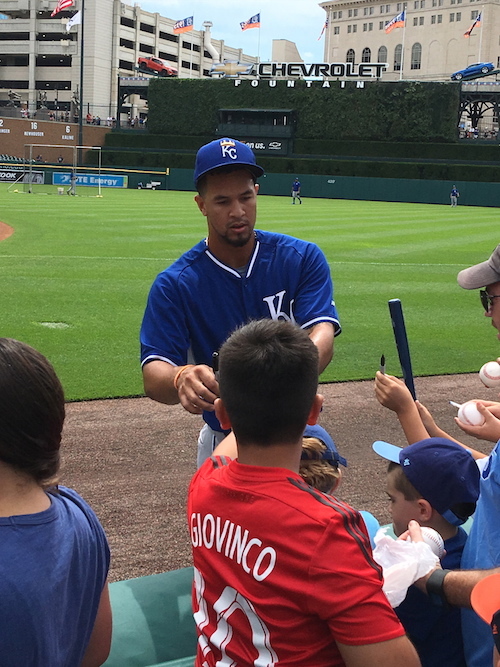 Not long ago, Lance Martinez of My Detroit Sports, captured this original photo of Royals 3B Cheslor Cuthbert signing autographs at Comerica Park, in downtown Detroit. Cuthbert has replaced All-Star 3B and KC stalwart Mike Moustakas, who is out for the rest of the season, after tearing his ACL back in May. Going into Wednesday, the 23-year-old native of Nicaragua is batting .298, with 9 HR and 33 RBI, for the 51-55 defending champs, who currently sit in fourth place in the AL Central (10 games behind the division leading Indians) and 7.5 games behind the second AL Wild Card Spot. Royals fans can also view behind the scenes original video of the team signing, during their championship run, last October in New York.